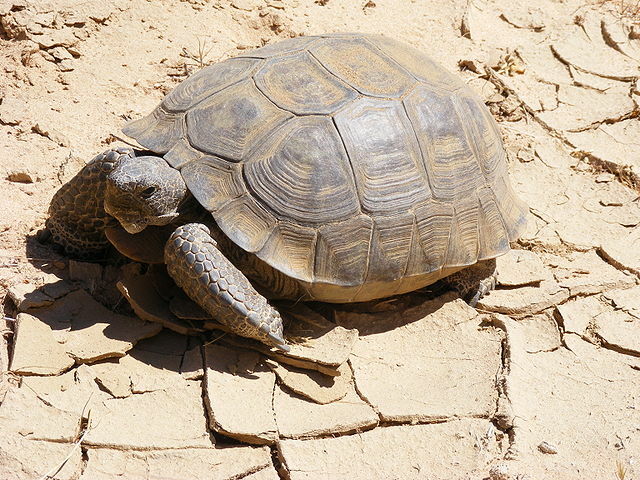 Example of an Agassiz’s desert tortoise. Photo by Tigerhawkvok – Own work, CC BY-SA 3.0, via https://commons.wikimedia.org/w/index.php?curid=4033692. San Diego Zoo Global conservationists announced Friday they have partnered with other agencies to bolster California populations of the threatened Agassiz’s desert tortoise. Tortoise populations have dwindled in recent years due to habitat loss, disease, predation and limited regulatory protections. Working with the U.S. Geological Survey, Edwards Air Force Base, the Bureau of Land Management and water utility Cadiz, Inc., Zoo Global researchers are preparing to implement “head-starting techniques” that will provide hatchling turtles a safe place to mature before introduction to their natural desert habitats. Apart from potentially improving young tortoise survival rates, the project presents a strong research opportunity, said Ron Swaisgood, recovery specialist for Zoo Global. Partners began radio tracking more than 30 female tortoises at Edwards Air Force Base and BLM’s Mojave Trails National Monument in April. They were eventually brought to a head-start facility to lay eggs before being returned to their original territories. After hatching, newborn tortoises will be reared until they’re 6 to 18 months old; then they’ll be released to desert habitats for continued study. Because juvenile tortoises are typically difficult to find and research, study participants expect to gain greater understanding of habitat requirements as a result of their work. Agassiz’s desert tortoises are native to the Mojave and Colorado deserts of California. The creatures have slow reproductive rates and slow growth but often have life spans of 50 years or more. Female tortoises generally lay eggs in burrows, where they incubate on their own. Young tortoises hatch fully formed, independent but small in size.